Looking for a good restaurant? A place to spend a pleasant evening? Or simply a place to relax? ... your dream starts here! 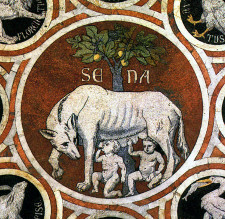 The origins of Siena are lost in the Etruscan time, although a legend say that it has been founded by Senio, one of two sons of Remus, the brother of Romulus, founder of Rome. According to the legend, the two brothers fled from Rome to escape from his uncle who wanted them dead; in the flight the two stole a she-wolf made out of marble and they brought it as a trophy in the place where they took refuge and where he founded the new city. The wolf is still the symbol of the city. Over the etruscan settlement was built, as often happened, a Roman military colony at the time of Augustus, Saena Iulia, which in later centuries grew thanks to the location, on the road consular Cassia first and then the Francigena. Beeng a thriving city since the tenth century, Siena became a place of merchants, bankers: Monte dei Paschi, the popes: Pius II - Enea Silvio Piccolomini and saints: San Bernardino and Santa Caterina. The war between Guelph and Ghibellines sees Siena opposed to the Guelph Florence led to constant battles, the one of Montaperti is commemorated today in the historic walk of the Palio. With the plague of 1348 began the slow decline of the city, until the fall of the Republic and its submission to Florence and then the incorporation in the Grand Duchy of Tuscany, until the unification of Italy. The treasures of art and architecture preserved in the city will amaze you with their great artistic and historic values. DISTRIBUTORE ENI DI GENTILI E PARENTI S.N.C.